The Littles Are Running Amok!!! OH NO!!!!! The inevitable has occured! Mind you, the timing could not be worse! I am out of space here on Tripod. For the time being, I'm going to try posting on blogspot. Bear with me while I figure this out and I'll keep you posted. Cankles? What the heck are cankles?! On one of the message boards I read- a woman coined the term "cankles" for legs with no discernible difference between calves and ankles on swollen pregnant mamas. Another mom noted that she no longer has "cankles". Instead she has graduated to "ceet". Calves to ankles to feet- just a pair of ill-defined appendages. Guess what?!!?! Yes, we're still pregnant. Shocked? Thought not! We have another appointment for next Tuesday. I told him, I might really make it to May 22nd (which was the plan way back last August)! He said, "Oh, you need to think positively." Ummm, yeah, I am!!! That's what I want! Silly guy! Are we done with school yet?! As a matter of fact, we are!!!! I decided Monday, after co-op, that we have done all we "need" to do this year. We're done with science, math, spelling, history, and so on... So, Monday was our last day of school. We will pick up math facts, typing, and handwriting to do in small bits each day starting in June. The kids have done so well this year, the weather is nice, and mama needs a break before baby arrives! Here's today and the first day of "school/ co-op" from September. 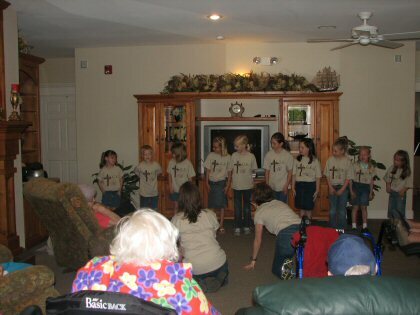 Today, they went and sang for a retirement home and then passed out treats to the residents. She might be quiet, she might be shy, she might have to coaxed a bit to smile, but she loves this! 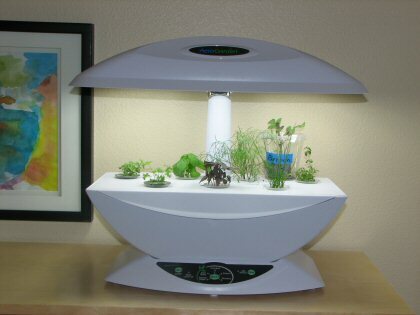 Well, looks like the AeroGarden really does work. Looks like we'll be cooking with fresh herbs soon enough! George was less than impressed with my directive to come in from outside to take a nap. 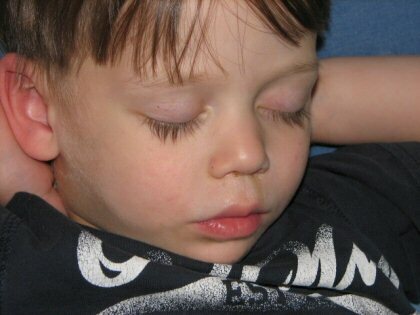 He complied (barely) and went to bed, I thought... He was very quiet and I assumed he had gone right to sleep. Ha ha!!!! 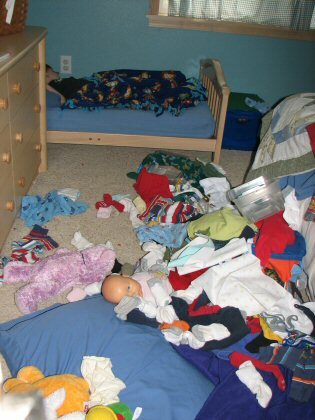 He did sleep- just not until he dismantled his room. Argh! Am I one of "those" cranky pregnant ladies? Just wondering... I don't think I am generally cranky. Especially when pregnant. Really! But this week~ it doesn't seem to take much! Today, I woke with a raging allergy attack. Seems all things botanical bloomed overnight! 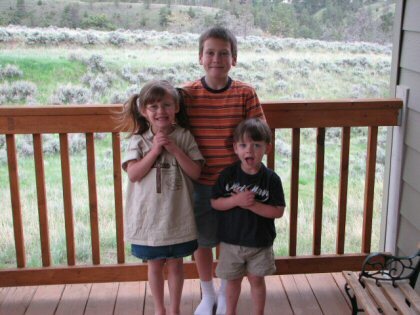 My kids were acting a bit under the weather yesterday and Brennen woke up crying early this morning. Just didn't seem to be a good start to the day. We got ready for MOPS. It's the second to last meeting and a big outreach day. Our mentor moms put on a Mother's Day Brunch for our moms and their guests. I was kindly allowed to pass on all aspects of planning this event. I was looking forward to going to MOPS just as a mom. Hmmm... should stayed in bed! Apparently, school is out today. 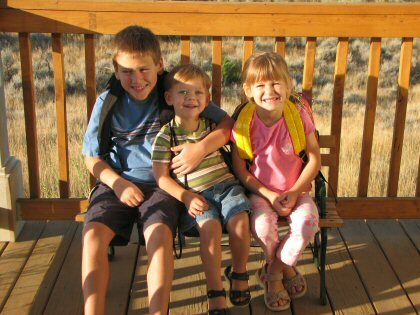 Since we provide childcare, this always increases our numbers of kiddos dramatically. And, the highschoolers usually available to help all seemed to have something else scheduled. I didn't know this until this morning (remember: I'm not in charge of childcare ever OR of anything MOPS today). So, running late, late, late, and being tired, cranky, and sneezy- we head to MOPS. Turns out, we have no childcare workers today and that's a HUGE problem. Well, we had one or two... So, I spent my two hours doing what I can to corral and entertain twenty-seven (yes! 27!!) kids ages three and up. There were lots of younger kiddos downstairs along with the babies and walkers. I am not the only one who gave up MOPS to watch kiddos. I am not special or exempt. I am supposed to be the fearless coordinator... I don't really even mind. I'm just HUGE pregnant and seemingly a bit crabby! Enough pity partying! Just had to vent... Oh, and as most of you know, kids ("other people's" variety) are just not my thing. So crabby here is going to take a nap and see if that provides the needed attitude adjustment. If not, at least I'll be a well-rested cranky lady! Baby is still content to be inside. Our non-stress test was "reactive" which means baby does what it's supposed to do with movement, contractions, and so on. I'm still quite comfortable and things like blood pressure are just fine. I wasn't feeling well when I went in (nauseated and such) and after an internal (ouch) exam, I felt much worse. Made for a long, non-productive day. Although, it gave me a bit more motivation to get ready for baby. Baby really could come anytime. Ack! Last night, I went to my monthly MOPS table get-together. As a table (there's about 8 of us), we meet about once a month for an activity. We've gone to the ceramics studio, to a movie, scrapbooking, etc... It's a nice break from kiddos and it's fun. Last night, they had planned a game night at Amber's house. I leave a bit early so I can stop by Target (unattached to little people) and peruse the baby aisles. I need a new diaper bag. One that will accommodate my notebook as well as baby essentials. Shopping was lovely. 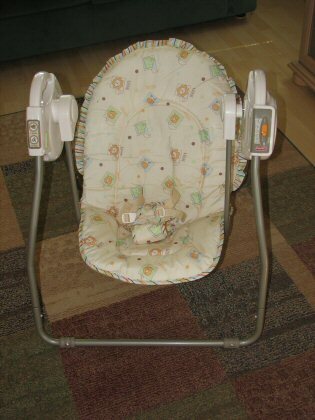 I walked around- looking at baby things for the 1st time with this pregnancy. I chatted with Michelle on the phone while debating nursing pads and diaper bags. I bought an ice-cold Diet Coke to take to game night and headed off to Amber's. Well... I pull onto her street and noticed immediately that there were more cars than people at my MOPS table. Hmmmm... Then I noticed Amy's van. Her youngest child is eleven! Not a MOPS mom for sure! Now, I get it! I called Amber (from the safety of the mini-van) to tell her that I am NOT coming in! I don't like surprises! Do NOT! "Too late- too bad- get in here" was the gist of her response to me. It was very sweet. These generous friends of mine, who know that we "need" nothing, wanted us to feel a bit more prepared. They brought lots of diapers, wipes, burp cloths, and other essentials. Not to mention, some toys and other fun things. Despite being embarrassed, I am very grateful. I am blessed to call them friends! No one took a single picture at the shower (despite many of us being scrapbookers!) So... Here's the best I can do. The playpen has been "resting" unassembled/ uncleaned in my living room all week. 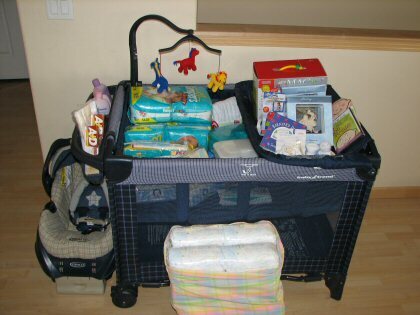 All this baby "activity" prompted me to get it set up and clean and it gave me a place to put all these goodies! 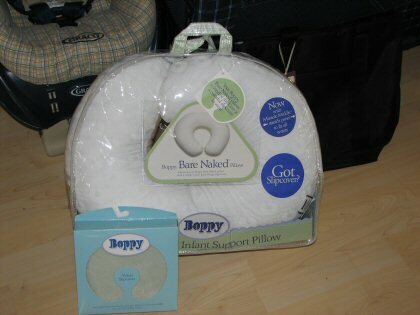 On the subject of baby presents: Michelle was worried that I couldn't find our Boppy pillow. She sent this beautiful new one with a super soft cover for baby. Can't wait to use it! My totally utilitarian diaper bag is sitting behind the Boppy.